Hello, and welcome to the Holiday 2016 Essentials by Ellen Release Hop! I’ll be showcasing several of the new stamp sets and dies on my post today! You should be arriving here from the amazing Brandi Kincaid's blog - Brandi has some awesome designs in this release - amazing illustrations that capture the holidays perfectly! I always love the EH holiday release because the stamps and dies are perfectly designed and so unique! I have so many more card ideas that I can't wait to create! 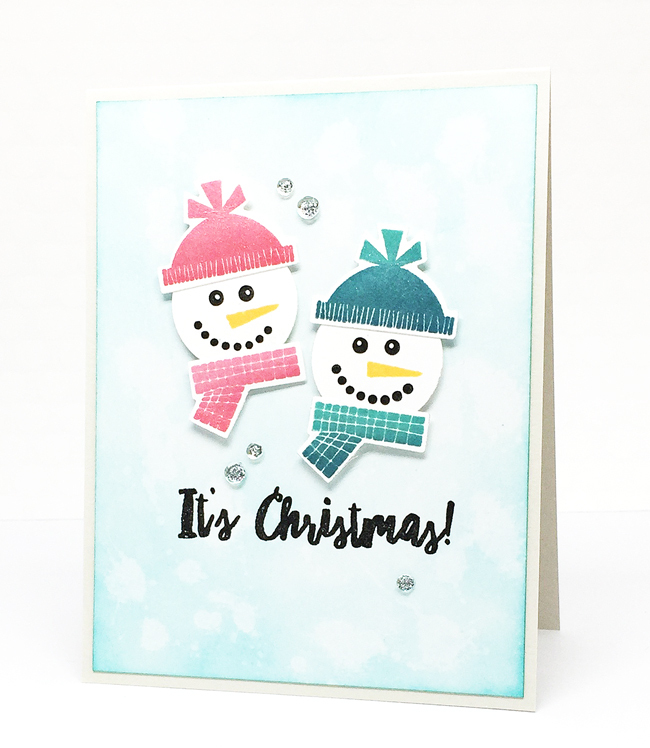 For my first card today I used the new Fat Pants Stamps and Dies to create an adorable Mr. and Mrs. Snowman for the focal image on my card. I love that you can stamp and diecut all of the pieces of the snowmen individually and then put them together. Makes it super easy to make them any colour or design for different looks every time. I added some colour to the background panel on the card with Broken China distress ink and then I added some water and dabbed a bit off with a paper towel for a distressed look. I stamped the sentiment under the snowmen with Versafine Onyx Black ink and then I added some clear sequins for some added detail and dimension. For my second card today, I used the new Believe die and an ornament die from the Fat Pants dies to create a soft background with a bold sentiment. I first diecut the ornament from masking paper and I added it to my white card stock panel. I then used Broken China distress ink on an ink blending tool and pulled the colour out from the center of the ornament mask onto the white card stock panel. When I removed the mask I was left with a white ornament shape with the aqua colour surrounding it. I diecut the top of the ornament a second time from silver sparkle card stock, cut off the very top and adhered it to the ornament on the panel. 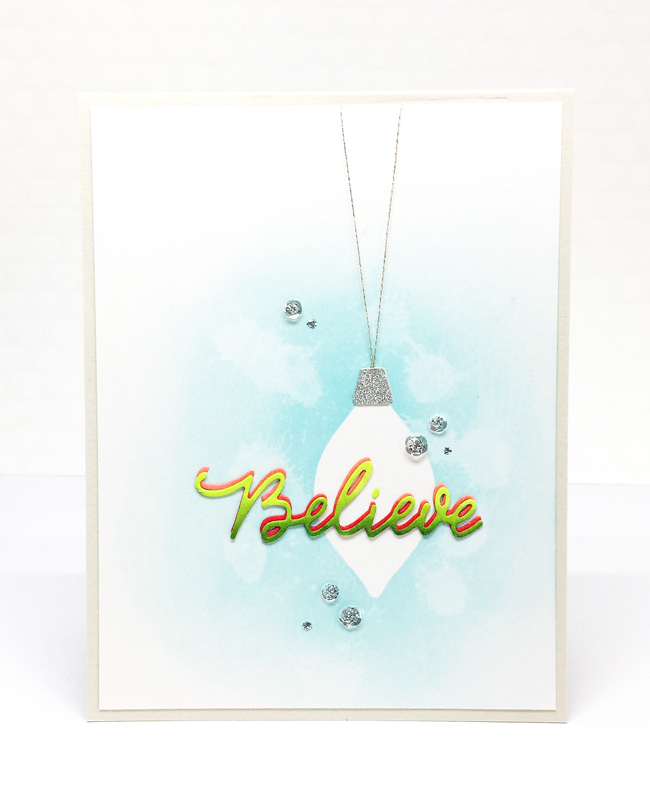 To create the sentiment, I diecut the word Believe twice from white card stock and used various shades of green and red Copics to colour them with an ombre look. I then adhered them together, slightly offsetting them so the red would through from behind the green.I love the traditional pop of colour against the soft background. I finished the card by adding some silver string to the top of the ornament and also added some clear sequins around the ornament on the card. 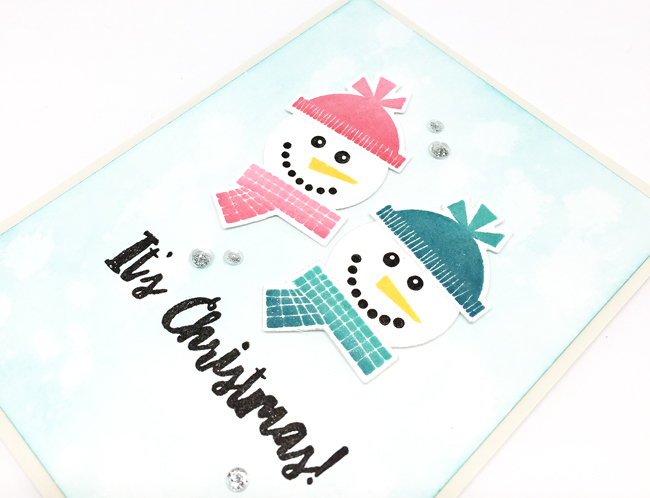 I couldn't stop at two cards, so I created a third one using the new Homespun Holiday stamp set and dies. I love these fun whimsical designs and that wreath had me at hello! I am very picking when it comes to wreath shapes and this one is perfection! I stamped the wreath lightly with black ink and then I coloured the entire thing with Copic markers. I then stamped it a second time directly on top with Versamark ink and heat embossed it with silver embossing powder. I stamped the sentiment from the Season to Sparkle stamp set on a banner cut from vellum and heat embossed it with the same silver embossing powder. I then added it to the card front with a silver sparkle banner, a strip of aqua coloured card stock and a black and white striped patterned paper. 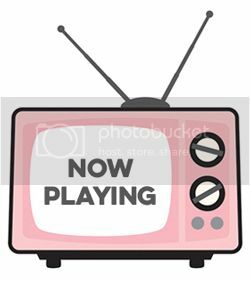 Thank you so much for stopping by my blog today for my stop on the hop! I am so so excited to see what everyone creates with the new release and I can't wait to share more cards using it! And, yay!!! I also get to give away an Essentials by Ellen stamp set! The winner may chose ANY Essentials by Ellen brand stamp set (Maximum value $25 USD) currently in stock at Ellen Hutson.com. To enter my giveaway, please leave a comment on today’s post by Tuesday, October 25th! There is also a crazy good Grand Giveaway in the CLASSroom! To enter, be sure to leave a comment there, also by Tuesday, October 25th! ALL winners will be announced at the CLASSroom on Friday, November 4th! Please check there on that date to see if you are a winner and for further details on claiming your prize! Your next stop on the hop is my amazingly talented friend Amy Kolling! Your cards are wonderful and have such amazing details! Awesome cards! Love the snowman in particular! These are great cards. Love the colors you used on them. I love your cards! Happy colors! Great cards! The simple Believe card is my favourite. Love your wreath card. So pretty. Great cards; I really like the wreath card. Wonderful cards...the snow people and wreath cards are great! Love the colors in the cards. This is a great release! I love the wreath card for sure. And the wonderful snowmen. Oh I like all the cards. Beautiful cards! Love the snowmen! Lovely cards!! Love the wreath!! Your cards are beautiful. I especially love the ornament wreath card with the velum greeting! Super!!! love your snowmen, and love your use of the ornament as stencil! Three great cards, Stephanie. Pretty colors, CAS designs and all beautifully done. I especially like the vibrancy of the wreath card! Love your cards Stephanie, such gorgeous colors and just like your style! My fav is the wreath one! TFS! I love your cards Stephanie! Those snowmen are just too cute, and I love how you colored the ornament wreath. Such an awesome new release!! Cards are A-dorable!! You have such creative talent! The simplicity of your cards is so appealing. Thanks for sharing your talent. Fantastic CAS cards, Stephanie, love them ALL! Beautiful and darling cards. Love those sweet snowmen! Stunning cards - thanks for sharing your talent! These are all very pretty, but the ornament one is my favorite! TFS! Great cards! My favorite is the wreath card, so lovely! I love to get new ideas ! Great cards! Love the ombre inking effects on each one. It's hard to pick a favorite, but those snowmen are so cute and happy!! I love your cheerful style! Adorable snowmen!! Love the possibilities with this stamp set!! These may be two of my favorite cards in this Blog Hop. Love the colors. I must have the wreath stamp. beautiful card! Love your new cards fellow Canadian crafty mama! The little snow people are my favourite I think! So darn cute! What fun Cards! thanks for the inspiration! Love your cards. The snowmen are adorable. Beautiful wreath. Your snowman card is adorable! Great cards! So fun! The one with the snowman is so happy. Love it! Great clean and simple cards! Thank you for sharing your talented designs to inspire us all! Wowzers Stephanie, these are great! Love your touches of blue. The wreath is beautiful, wonderful colors. The snowmen are too cute!! Those dopey lookin' snowmen made me laugh out loud. Love 'em!!!! Love the bauble card. The colors go well together. Love your homespun card. The addition of the silver glitter paper is so pretty! The colors that you chose for each of your cards are perfect! And that Homespun Holidays card is my favorite! Oh what fantastic cards Stephanie. Love the Mr & Mrs Snowman, super cute! Your ornament and wreath cards are really lovely! All your cards are beautiful and very inspiring. fabulous set of cards... really love the design on the second one! so very unique! Really pretty cards. I love the snowmen! The cards are fabulous, the designs are so fun. It's also perfectly executed!!! Stephanie, your cards are perfection, as usual!!!! Love them! Cute cards, love those darling snowmen. These are wonderful! Love your coloring on the wreath - just great! Thanks for sharing! Beautiful cards ! These snowmen are so cute ! The two other ones are very stylish. Beautiful colouring of the wreath. Great cards.. super cute snowman card. Thank you for sharing your ideas. Great inspiration here for holiday cards. It is sending me to my craft area to create. I think I am loving the wreath first and then the snowmen. Cute! I love them all, Stephanie! They are so fun and gosh, you know my heart: white space + color = perfection! XO! Thank you, my friend! All of your cards are gorgeous! Those snowmen are adorable! love that cute snowman card!! Clean and simple cards are so much fun! Thanks for sharing yours! Super cute cards! I love the snowman one! Your cards are so unique! I really was impressed with the single white bulb that looks like a necklace placed against the red sentiment. Very artistic. All of your cards are just fantastic .. great release! Adorable cards! Your snowmen faces pulled a smile off me. Love your coloring on the Homespun Wreath! Nice. Love the snowmen and the wreath. Fabulous cards and techniques. I really like the cute snowmen. Your cards are fabulous and you've shown how versatile the stamps and dies in this release are. TFS! Those snowmen are adorable and I just love that festive ornament wreath! Lovely cards! Great color choices. I just love that fat pants stamp set! Your cards are terrific! Fun cards! Love those snowmen! Your ornament cards are so elegant too! Great release and fun blog hop! Thanks for sharing! Adorable snowmen!! Love that card! Love your cards! And, I love the new release. Stephanie, Your Mr&Mrs Claus is so cute, the ornament is cool, love the wreath the colors and layouts uptown. Your snowmen are adorable Stephanie and the ornament and wreath cards are delightful. Thanks for sharing with us. This release is just amazing. I am loving all of these new stamps. Your designs are just beautiful. Love the wreath card the best! Love the wreath card too ! It looks so bubbly and cute ! Simple designs but so striking! Love the snowmen card especially. Lovely cards! I love the masked background on your believe card! Your designs are wonderful! And such a great release! Wow! Gorgeous cards. I love the way you used these new designs. It's always fun to see all the different ideas and with these great stamp sets and dies, they are sure to be so good.! I love the background with clean ornament! Your designs give me many inspirations! Beautiful cards and each is so different in style and technique. Love this release. Wow, Steph, your cards are awesome! You really show the potential in the "Fat Pants" set. And ooh, the believe sentiment! I really love that wreath image, too, and it looks great here. I love your pretty, soft backgrounds! Great release and your cards definitely do it justice love them all tfs. Just love the Christmas Wreath card, Stephanie! Simple and cute! You have a really fun and modern take on Christmas cards-- nicely done! Those snow faces are adorable! Oh my SWEET...love them all. Lots of great ideas on your blog! You are right, there are so many ways to use all these wonderful dies and stamps. These are wonderful! I love those snowmen on the first card, but that second card, elegant, CAS perfection! I love all your cards! I think I like the last two the best...sparkle baby! Gorgeous projects!! Love the snowmen!! Fabulous ornament card--so different. I love that one. Absolutely LOVE the snowmen card!!!! Beautiful cards, so fun and love the vibrant colors! Love your projects! Thanks for sharing on the blog hop!! Lovely cards. I like your wreath layout best. Delightful cards! Love the cute snowmen and their ombre attire!So fun! Love the idea of heat embossing AFTER coloring with Copics, so that the embossing doesn't ruin the marker tip. With the Mistie, it's easy to line it all up again! What a great idea! Oh wow! Your cards are aadorable!!! The snowmen are darling. Love the color combination. Your cards are gorgeous, love them all! Great cards - so colourful and cheerful! Wonderful cards. 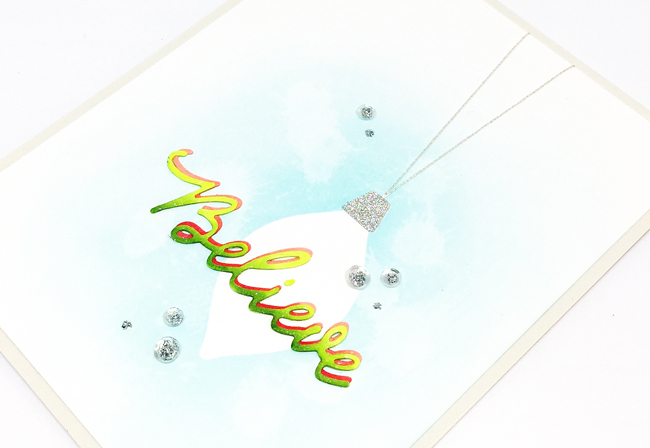 I really love your card with the masked bauble and the believe die - absolutely stunning! I'm so loving your sweet cards with a fun, retro vibe! That bubble wreath rocks and your soft backgrounds are spectacular! Thanks for this sweet inspiration. Adorable cards! I especially like the snowmen! Love all of your cards! Great design and perfect colors! Great collection of cards! I love that wreath stamp also and I love the way you treated it with the silver embossing. My favourite of your cards. Oh my goodness, how adorable are those snowmen?? Love it! And the wreath card is fabulous as well.....there are definitely several things on my EH wishlist now!! Cute and beautiful cards. Love the "believe" die. Adorable snowmen, love them! Great cards and I love the wreath! Such great cards. I love how you did the "believe" die. A great job on them all. Very lovely. Such creative fun! The snowman is darn cute and I love the wreath one too! Thank you so much for ALL the inspiration. Especially love the wreath--so beautiful. How fun what you did the Believe die. Thanks for the idea. Such pretty cards and great colors! Great cards from a wonderful holiday release. Great cards!Thank you for the inspiration! Love all the pops of color on each card! Love all these fabulous designs! The simple ornament is my favorite! Love your colorful wreath! Thanks for sharing! The Fat Pants set is my fave. I love the snow men and ornaments in the set. Wonderful cards one and all. The colors of your cards are gorgeous. Thank you for your ideas. I am loving that wreath. Perfect and so elegant. Thanks for sharing. Beautiful cards! Love the sparkle on the wreathe card and the first card is really cool! Absolutely amazing cards. Love this release! You cards look really amazing. Wonderful inspiration. I love your idea about heat embossing the wreath after you coloured it...that's been noted in my idea book. Wonderful cards ...I especially like the Christmas wreath one. What lovely holiday cards! Your color combination with the wreath is stunning! Great cards, I really like the masked ornament one! Thanks for sharing! I like the colors you chose on your awesome cards. Your bright cheery cards are wonderful. Very pretty cards. I especially like your wreath card. Beautiful cards! Love the colours of the wreath! Your snowmen are adorable as is the wreath but I love how that bulb seems to glow! Love all three cards - but those snowpeople really stole my heart. They are so fun and really unique. Beautiful cards! Especially love your beautiful wreath card! The believe card is gorgeous! Thank you for sharing your ideas! Love them! So many beautiful cards! Love the cute snowmen! Wonderful and festive cards. Love your fun CAS designs. Oh, the "believe" card is stunning. Great job on the cards, Stephanie! Clever idea with the ornament, using the mask. And that wreath is adorable! Thanks so much for sharing with us and for participating in this great hop and giveaway. Love the soft backgrounds on your cards. They really make the images pop. Well done. Thanks for sharing. Beautiful cards! Love the idea of using the negative space of the bulb! Love the bold border and the vibrant wreath. Great cards! The Fat Pants set is my favorite - thanks for the inspiration!